Our elegant cheesemobile, aka a Buick Verano Turbo, at Mt. Revelstoke in B.C. Another successful Great Canadian Cheese Festival is behind us and it’s time to start planning another road trip—in search of cheese and other delights. 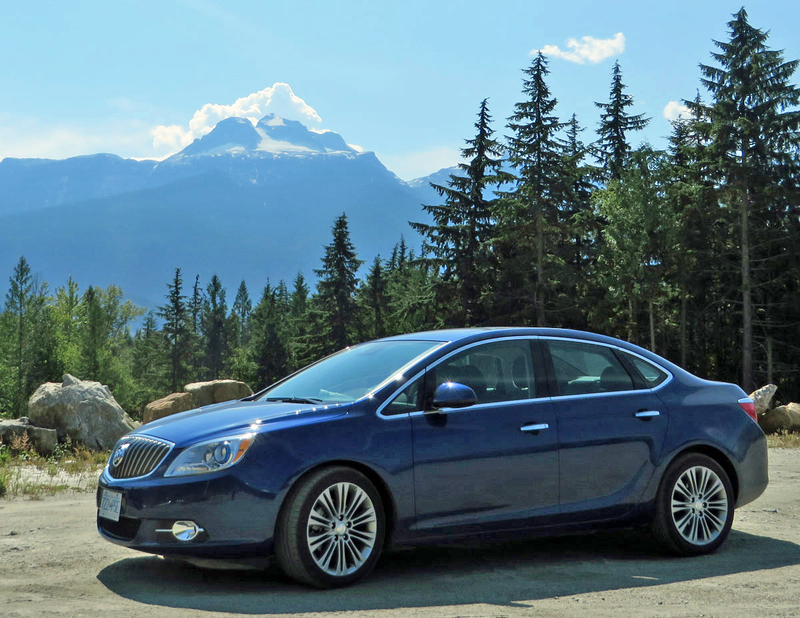 Last summer, an elegant Buick Verano Turbo served as the cheesemobile as we hunted for the best in cheese in British Columbia and researched venues for a future Great Canadian Cheese Festival West. This summer, the general plan is to head into Québec and eventually circumnavigate iconic Gaspésie to satiate our second love—fresh seafood. Of course, a visit to the region’s sole cheesemaker, Fromagerie du Littoral, will be on the itinerary. Initial destination: Ste Elisabeth de Warwick two hours east of Montreal. Festival Des Fromagers Artisans du Québec held this year at Fromagerie du Presybytère. The annual festival travels from cheesemaker to cheesemaker and attracts upwards of 10,000 cheese enthusiasts. Visit Fromagerie Abbaye deSaint-Benoît-du-Lac and Fromage de La Station in Eastern Townships. Fromagerie FX Pichet in Sainte-Anne-de-la-Pérade. home of Le Baluchon, the Canadian Cheese of the Year. Grand tour of Gaspésie, some 1,200 km in all, searching for the freshest seafood and other culinary delights during 10 days along the south shore of the Saint Lawrence River and into the Gulf of Saint Lawrence. Breathtaking panoramas and tasty maritime cuisine await. Fromagerie le Détour in Témiscouata-sur-le-Lac, home of Magie de Madawaska, a wonderful soft cheese worth driving many days for. Overnight visit to Isle aux Grues in the middle of the St. Lawrence River east of Quebec City from whence comes Riopelle, one of Canada’s iconic cheeses, named after Jean-Paul Riopelle, a larger-than-life painter and sculptor who spent his summers on Isle aux Grues and died there. Return home to Ontario with coolers full of goodies. If you have recommendations for must-make-stops along the proposed route, we’d love to hear them. Click here to e-mail CheeseLover.ca. Cheesewerks Original: Aged and double-smoked Balderson cheddars are grilled on cracked-peppercorn sourdough and served with roasted-garlic-red-pepper ketchup. 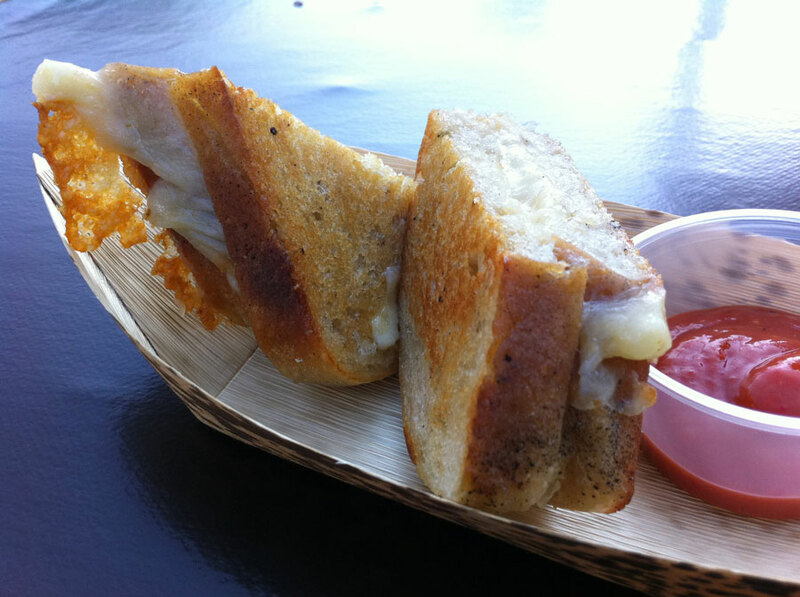 Cheesewerks has been named Official Grilled Cheese of the second annual Great Canadian Cheese Festival taking place June 1-3 in Picton, in the heart of Prince Edward County, the newest VQA wine region in Canada. The Toronto grilled-cheese emporium is Canada’s first and only restaurant totally dedicated to placing artisan cheese at the centre of every plate. The Festival is Canada’s only event to showcase Canadian artisan cheese from coast to coast, along with artisan foods, fine wine and craft beer. 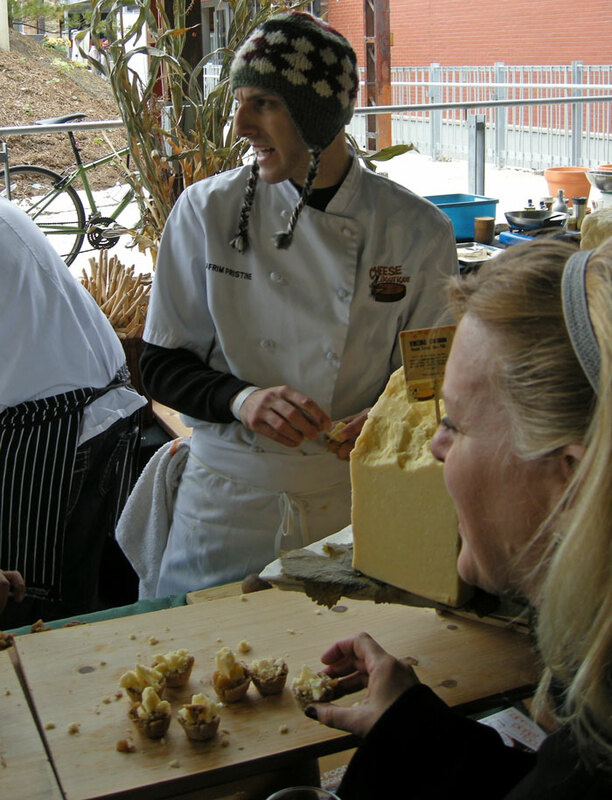 The Cheese Festival and Cheesewerks share the same mission: promote the best in Canadian cheese. Cheesewerks will be joined in the Festival’s food court by Buddha Dog and Primitive Cuisine during the Artisan Cheese & Fine Food Fair on Saturday and Sunday, June 2 and 3. Space is limited at historic Crystal Palace and grounds. Save money and avoid disappointment by purchasing tickets online. Hey, cheese lovers! Please pass the word on the upcoming Great Canadian Cheese Festival by using the Facebook, Twitter and e-mail buttons at the bottom of this post. For Festival information and tickets, go http://cheesefestival.ca/ Thanks for your help. Cheese be with you! By the way, do you have your tickets yet? Here are the cheeseheads who work behind the scenes to make The Great Canadian Cheese Festival happen. 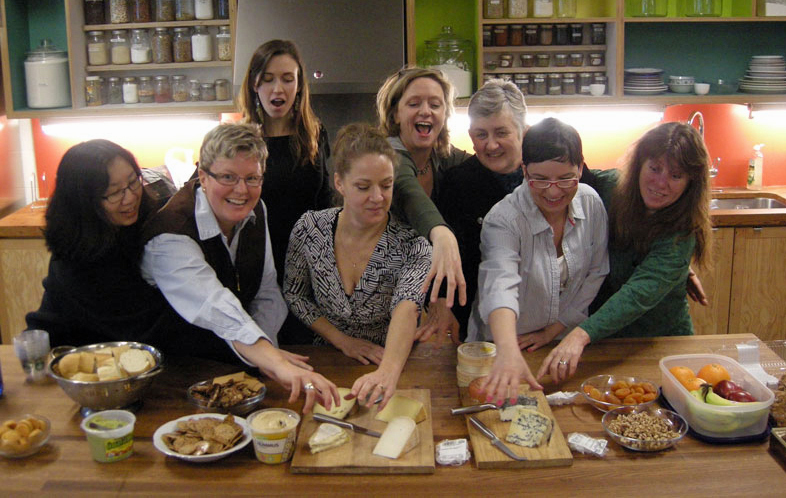 From the left, Lin Chong, registration co-ordinator, Jackie Armet, cheese co-ordinator, Becky Lamb, volunteer co-ordinator, Terry Chong, operations manager, Karin Desveaux, executive director, Peta Shelton, Prince Edward County liaison officer, Ivy Knight, cheese gala co-ordinator, and Rebecca Crosgrey, event co-ordinator and assistant to Georgs Kolesnikovs, founder and director. Gunn’s Hill Artisan Cheese: Hard and Semi-Hard, two impressive cheeses, the first like a Gruyere, the second like a Gouda, produced by Shep Ysselstein, a young chessemaker, in southwestern Ontario. Fromagerie Fritz Kaiser: Tomme du Haut-Richelieu, a lovely washed-rind, goat-milk cheese from one of Quebec’s artisan-cheese pioneers. Brillat-Savarin: A luscious triple-cream Brie with a truffle from France was devoured with much smacking of the lips. Fromagerie Le Détour: The distinctive Grey Owl—with its dark ash rind—is sweet, tangy and creamy, a terrific example of the high standard of goat-milk-cheese production in Quebec. Fromagerie de l’Abbaye Saint-Benoît: Bleu Bénédictin, a Canadian classic made under the supervision of Benedictine monks in the Eastern Townships of Quebec. Époisses Berthaut: An extraordinary washed-rind cow’s milk cheese with a natural red tint from Burgundy in France is too powerful for some, worshiped by others. Ours came to us courtesy of Glen Echo Fine Foods. Fan mail, comments and ideas will reach the Festival event staff via cheeseheads @ cheeselover.ca. A 90-minute nap was in order after three hours of grazing at the fourth annual Slow Food/Evergreen Picnic at Brick Works in Toronto today. A capacity crowd of 1,200 sampled the best of Ontario’s sustainable harvest as presented by top chefs and leading producers, supported by a bevy of winemakers, craft brewers and producers of fruit wine and hard cider. Here’s how the Brick Works Picnic works: A chef, such as Giacomo Pasquini of Vertical Restaurant creates a dish—Tortello, in this example—using fresh ingredients from Bzikot-family run Best Baa Farm—sheep’s milk ricotta and a brebis frais filling—with a light lamb jus and vegetables—dried organic veggies and live kale sprouts—grown by Pfenning family-run Pfenning’s Organic Farm. 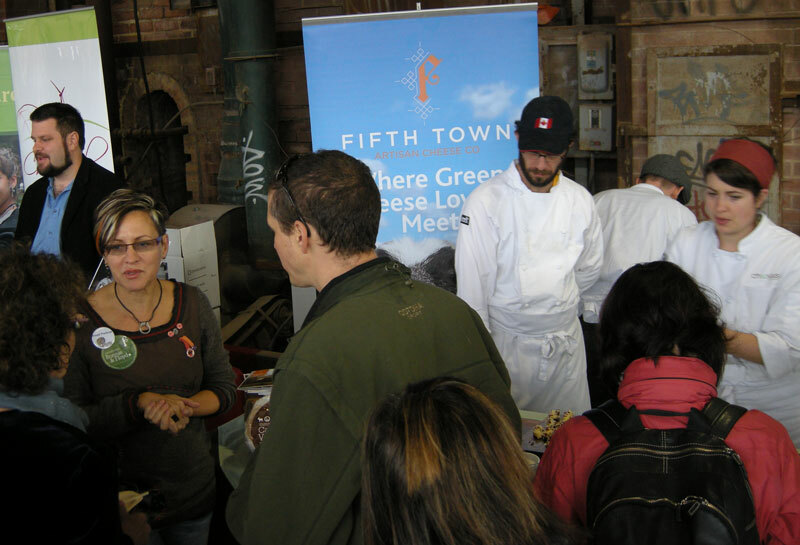 The tortello is served in a simple presentation mere seconds after it is made by the chef’s crew in one of 66—Yes, 66!—food stations spread through the renovated Brick Works, a singular cultural showcase devoted to urban sustainability and green living. 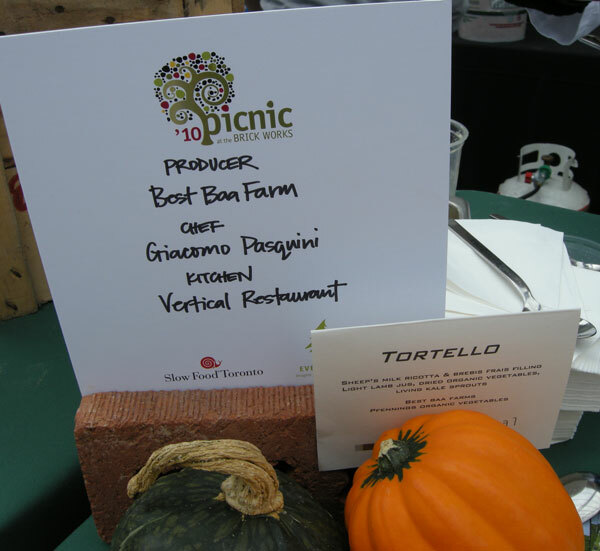 Monforte Dairy provided the Toscano cheese that was at the heart of the savoury thyme pound cake created by Table 17. Fifth Town Artisan Cheese was the only cheesemaker with a display of its own. Petra Cooper (at left) spread the gospel while Ezra Title of Chez Vous presented double-baked fingerlings made with double-smoked bacon and three Fifth Town cheeses, Cape Vessey, Chevre and Plain Jane. At the Cheese Boutique display, Afrim Pristine was kept busy cutting a 10-year-old cheddar that the cheese shop purchased from historic Forfar Dairy before it churned its last curds in 2008. Cranberry wine, Muskoka Lakes Winery. Here’s an excellent selection of Suresh Doss photographs from the Picnic. See also the photo essay by Jamie Drummond at Good Food Revolution. 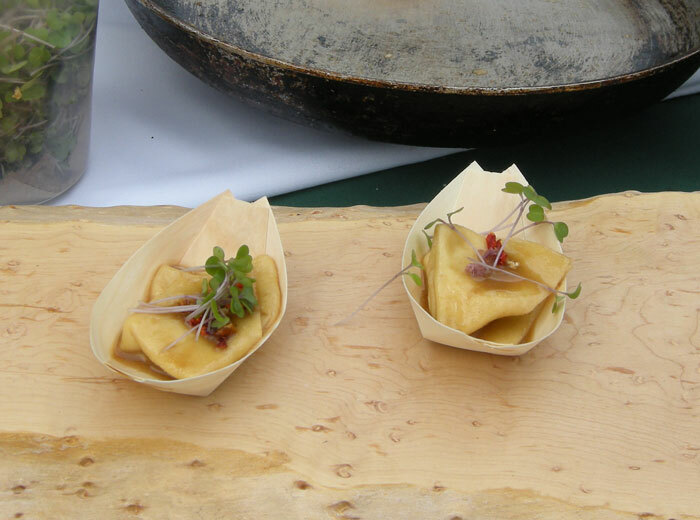 If you’re a foodie within reach of Toronto, the annual Picnic at Brick Works to benefit Slow Food Toronto and Evergreen is an event not to be missed. Even after the nap and a brush of teeth, the marvellous taste of Zane Caplansky’s smoked meat lingers on the palate . . .
Canadian Cheese Rolling Festival: Talk about craziness! It’s got to be the wackiest way to promote cheese but the Canadian Cheese Rolling Festival has proven to be highly effective—right out of the gate. About 5,000 people watched the inaugural event at Whistler, British Columbia, two years ago. Who knows how many will show up for the 2010 race this Saturday? What’s really surprising is that the crazy afternoon of cheese rolling and other activities for the whole family is sponsored and promoted by Dairy Farmers of Canada, an organization generally seen as staid. Cheese rolling is exactly that. A large wheel of cheese is rolled down a hill and daring men and women chase after it. The first contestant to make it down the hill wins. Vancouver Island cheesemaker Natural Pastures produced special 11-pound wheels of Cracked Pepper Verdelait cheese for the Festival. The winners get to take home the wheel of 100-percent Canadian cheese and a Whistler season ski pass. The race course will be set up in Whistler’s Upper Village on Blackcomb Mountain. Free round trip transportation to Blackcomb Mountain Base 2 parking lot via Excalibur Gondola in Whistler village is available for everyone. Anyone over 19 years of age can participate and contestants can register on site on August 14. The downhill event will consist of six men’s and three women’s races. The winner from each round will compete in the finals. For the kids, there will be six uphill races that will be a little easier. In addition to the races, spectators, families and contestants can take in a host of other fun activities including cheese bowling and cheese twister. Everyone will be able to sample delicious Canadian cheese, wander through a Farmers Market and participate in cheese seminars. Canadian comic and award-winning host, Jebb Fink, will be hosting the festivities. 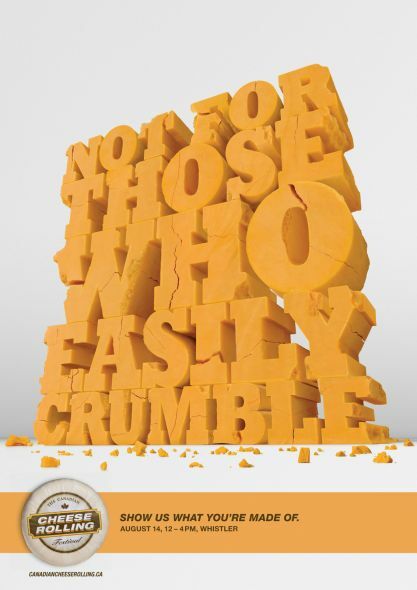 For more information about the Canadian Cheese Rolling Festival, click here. CheeseLover.ca has been unable to confirm that a cheese-rolling festival will take place this fall in Toronto’s High Park.